No, I'm not going to talk about Kate & Wills. It just seemed like the perfect word to describe where I'm at... stuck in the middle. No exciting new beginnings or finally finished projects, just lots of progress. The weather here was rather dreary so it made for a productive week. I'd already finished piecing the top of my watercolor quilt so I got the back together. I tried to mix some wonky bits with the straight seams so the schools of fish looked like they were swimming across the back. I'm scheduled to go longarm this in June but it's small enough that I'm wondering if I shouldn't just quilt it on my home machine. 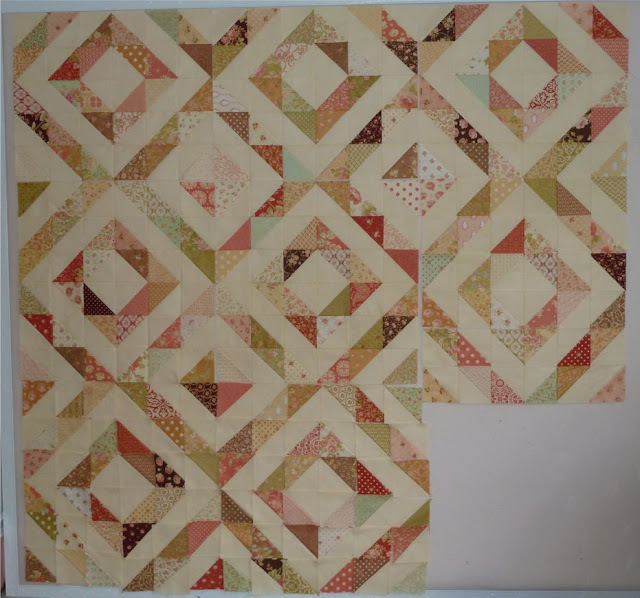 After that I worked on piecing together all those Fig Tree HSTs. I've got 5 of the 9 blocks put together but after laying it out on a bed I decided it's not quite big enough. I'm going to add another row to the top and bottom and probably on both sides also. I've ordered a Strawberry Fields charm pack which I'm hoping will also mix in nicely. Until then this is on hold. I'd want to have as many loose blocks as possible for mixing in something new... it makes getting that scrappy, random look much easier. 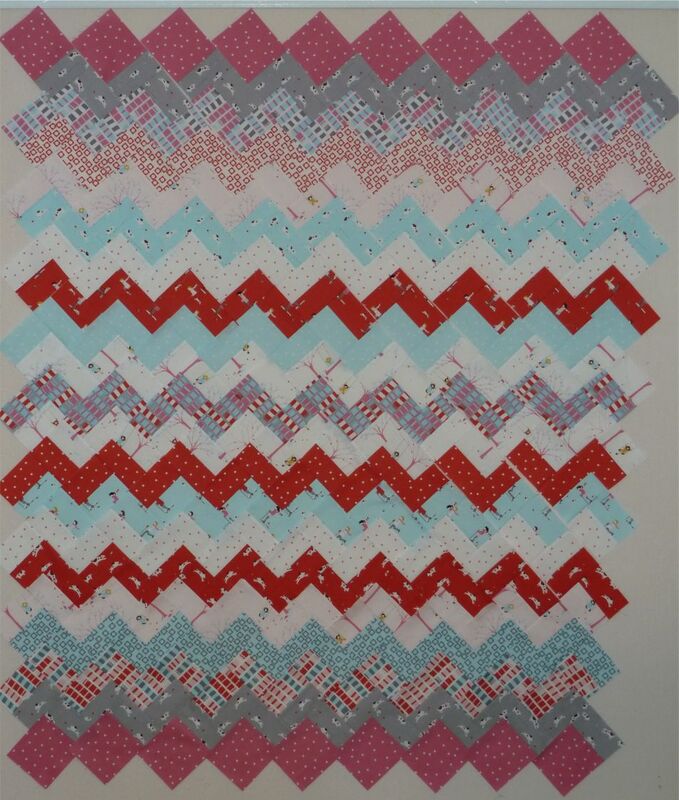 Finally, I put together all the rows for my Sherbet Pips zig-zag. I decided I want this to be big enough for my daughter's full-sized bed so I'm going to add some borders. I've still got a layer cake so I'm playing with a few different ideas. For now I want to float the zig-zags on the pink so I need to add setting triangles to the sides before I sew the rows together. Love the back of your watercolor quilt! The front is fab too but the back is really interesting. The HSTs are really nice - I love that layout. And the zigzag rocks! !